Here's my card for the current challenge at Global Design Project. I CASE'd Brian's pretty floral design, using a similar layout and color scheme but with a more modern style floral image. My florals are from the Fall Florals set from My Favorite Things. The flowers work well even in a definitely not fall-like color scheme! Here, I used pink and green pigment inks on the die cut pieces. I arranged them on a white panel with a dotted pattern stenciled on the bottom, using foam tape on one of the branches for dimension. The sentiment is from MFT's Whimsical Wishes. I've been going through some challenging times lately and this sentiment speaks to me right now... The finished panel was matted on a pale pink panel, then adhered to a coordinating pale green card base. 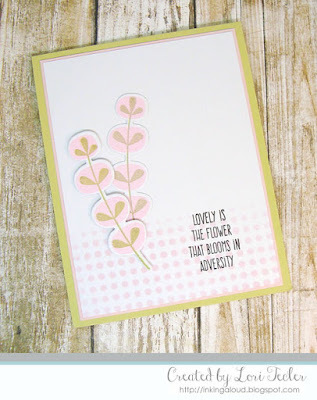 Love the florals and love the sentiment! What a great combination for a beautiful card! Thanks for playing along with my CASE the Designer at GDP this week. Oh I love this beautiful card. The colours are gorgeous. So beautiful and clean & simple!